John Thomas finds his passion rooted amid the bluebonnets. Each spring, Central Texas explodes into a riot of color as bluebonnets, Indian paintbrushes, coreopsis, evening primrose, firewheels, Indian blanket, winecups and more burst into bloom with the start of wildflower season. Spring getaways are planned to include these visions of wonder; weekend outings include detours through the most scenic routes, including one spectacular spot that offers endless fields of vibrant beauty. Just seven miles east of Fredericksburg on U.S. Highway 290, John R. Thomas nurtures this astounding display of eye candy at the nation’s largest working wildflower farm, Wildseed Farms. Born to a family of farmers and ranchers, Thomas grew up learning to work on the land. At a recent meeting he was a fitting portrait of grit and dedication, dressed in dusty work boots and faded blue jeans, skin bronzed by the sun, a cut on his hand held together with wiry blue stitches. In the early 1980s, prior to Wildseed’s conception, Thomas owned a sideline turf seeding business. During that time, he began to notice a trend on the highways and roadsides where he worked. “What interested me were the amounts of people pulled over on the side of the road,” he says of the crowds marveling at the flowers. Recognizing that untapped market, he began experimenting with wildflowers like the famed bluebonnet, collecting seed and harvesting it on his family’s farm in Eagle Lake, near Columbus. Throughout the process, Thomas discovered a personal passion that would eventually lead him to his work today. It’s been more than 30 years since this experiment first began. Today, Wildseed Farms encompasses more than 200 acres at its corporate office in Fredericksburg with an additional 600 acres in Eagle Lake. Since its founding, the business has grown considerably, introducing retail operations, wine and beer tasting venues and a nursery. Want to grow your own? There’s a bulk seed division with a mail-order catalog so the fruits of Wildseed can be shared with the masses. 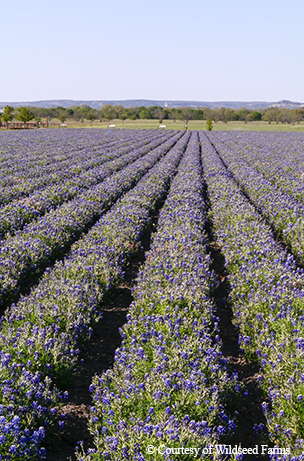 Ever the savvy businessman, Thomas recognized that by partnering with farms in places like Oregon and the Netherlands, he could create regional mixes and blends reminiscent of Texas wildflowers. With these varieties, people around the world could then plant and enjoy them in their unique home climates. One of the most common misconceptions regarding Texas wildflowers is the nature of their cycle. People worldwide celebrate spring in Texas for the miraculous color transformation that ensues. Thomas, with his tremendous farming tutelage, knows that the flowering fields and roadsides awash in periwinkle, pink and coral red are the result of a meticulous, scientific progression. The wildflowers’ journey actually begins in the fall, when seeds are planted. With fall and winter rains, the seeds begin to grow and germinate, eventually establishing a strong root system. In March, April and May, the flowers bloom and blaze in shades that defy the imagination. These blooms produce seeds, and after the blooms fall, the seeds mature. This is when the real work begins for Thomas and his team. Harvesting takes place from June to August, and together, they scalp and dry the seeds with the help of many tools developed on the farm, such as state-of-the-art seed cleaning equipment. Thomas doesn’t have to give me a hint to guess his most popular flower varietal. What else could it be but the state’s flower, the bluebonnet? John Thomas oversees multitudes of wildflowers at his Wildseed Farms outside Fredericksburg. Thomas’ passion for these iconic blooms is unmistakable. For him, the flowers are a nostalgic reminder of nature’s immense beauty and of a shared Texas experience passed down over generations. En masse, the flower’s trademark blue is arresting and deeply spiritual; Thomas believes that the sight inspires reflection, inviting those who witness it to slow down and savor the moment. 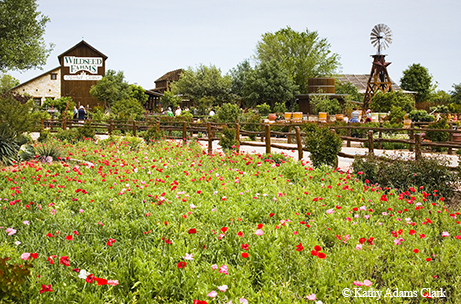 Wildseed Farms has evolved into a place laden with memories and tributes. Lady Bird Johnson used to visit the nearby farm a few times a month, and one of her favorite flowers — the showy primrose — is planted in her honor at the front of the property. Frequently, people come to spread their loved one’s cremated ashes at Wildseed, a place that fittingly conjures feelings of peace, hope and renewal. No matter the time of year, there’s always something blooming and growing at Wildseed Farms. Thomas’ belief is that even when the fields are bleak, before winter’s tiny sprigs transform into spring’s kaleidoscope of Indian blankets, cosmos, California bluebells and African daisies, the life and energy rooted below the farm’s surface should be celebrated. Much like Thomas’ faith, the wildflower’s spirit and energy is present even when the flower itself is invisible to the eye. In late fall and early winter, many fields across Wildseed Farms are layered in fresh brown soil, beneath which grow masses of wildflowers. Any baby bluebonnets that have sprouted can be identified thanks to their tiny leaves, which resemble Mickey Mouse ears the size of dimes. Equally fascinating is the wildflower’s journey. When the blooms fall and their seedpods burst, the seeds within them blow on, dropping wherever the wind takes them. 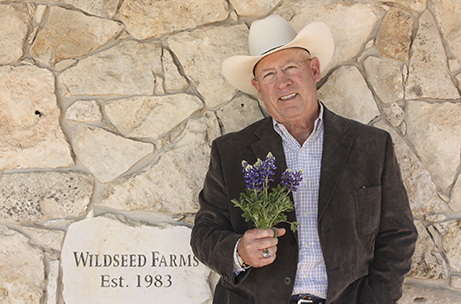 For Thomas, seeing a patch of flowers, such as bluebonnets, spring up in a place that wasn’t previously planted is one of the enduring gifts of wildflower farming. More often than not, these patches come as a surprise, blooming after being deep-seated and dormant for years.